Hosted by Congregation Shalom’s Social Action/Social Justice Committee. Tuesday, April 30, 7:00-9:00pm at Congregation Shalom. Everyone welcome! We’re very excited to have Whitney Taylor as our moderator. She is Political Director in the Public Advocacy Department at the ACLU in Boston. Ms. Taylor has worked on legislative and initiative campaigns around the country, and has been in MA since 2010. She holds a BA in Criminal Justice and an MS in Public Policy from American University in Washington, DC. Members will be able to stream the discussion, so if you can’t make it to the temple on April 30, you can join remotely. This is the powerful story of how a prominent white supremacist changed his heart and mind. Derek Black grew up at the epicenter of white nationalism. His father founded Storm Front, the largest racist community on the internet. His godfather, David Duke, was a KKK Grand Wizard. By the time Derek turned 19, he was regarded as the “leading light” of the white nationalist movement. In this book, Black tells the story of how white-supremacist ideas moved from the far-right fringe to mainstream American. It can help us understand what is happening in this American moment, and to better understand one another. 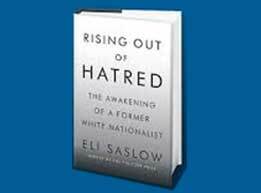 Listen to an interview with Derek Black and Eli Saslow on NPR Fresh Air with Terry Gross.